Frozen-mania continues to create excitement with children, and themed merchandise appears just about everywhere we shop (including the Dollar stores!). And there were more little Elsa trick-or-treaters this past Halloween than I could even count. 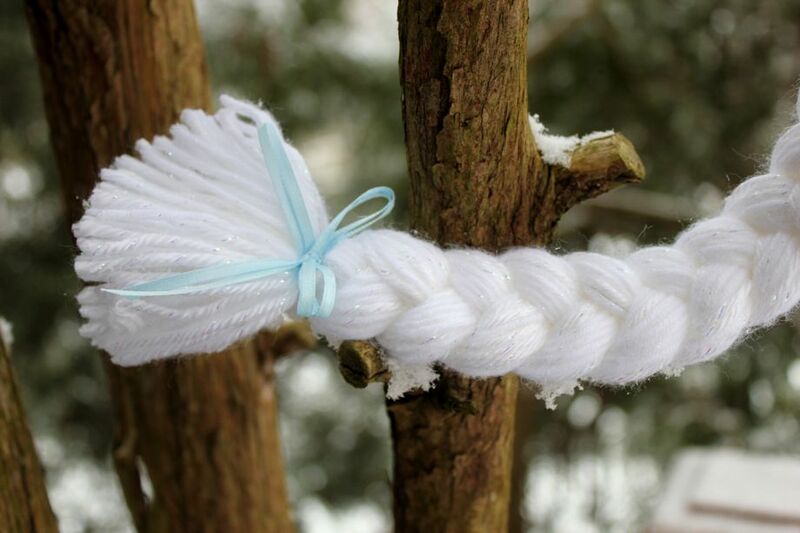 So when I came across this adorable pattern on Ravelry a few months back, I took a deep breath, made the purchase, and ordered enough yarn to make one for each of the 12 little Elsa’s in my life. 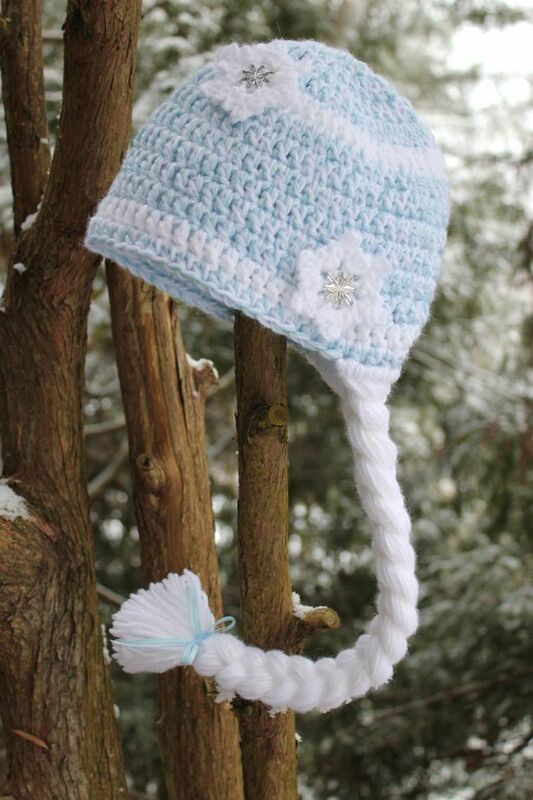 It is called “Queen Elsa Hat with Braid” by Ann J. Bacon (cost: $4). Since I loved the sweet combination of the soft blue and glistening white, I went with the recommended yarns, Caron Simply Soft Party and Caron Simply Soft Solids. And although I’m not a big fan of acrylic yarn, I thought is was a great choice for its softness and washability. Took me a while, but as I gazed at 12 Queen Elsa hats, my heart did a happy dance. So what about the three little Olaf’s in my life? Couldn’t leave them out. Back to Ravelry, where I located a free pattern called “Frozen Olaf inspired Hat” by Olivia Kent. After a quick review, I decided to blend the two patterns. I used the Elsa pattern as the base hat, added the tooth below the grin, and then used the instructions for the eyes (including brows), nose, mouth and twigs at the top from the Olaf-inspired hat. So cute. Wishing you warm hugs and very Happy New Year! Just adorable..and much appreciated I’m sure! These are just beautiful! The colors are perfect too! Thanks! The designer did a great job…they were fun to make. 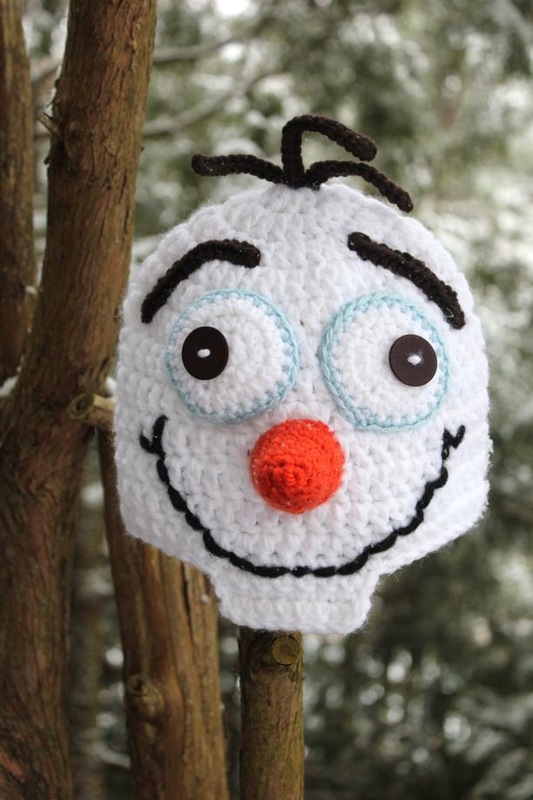 And of course the adorable Olaf hat…I love his happy face! I’d be happy to make one in an adult size…just say “warm hugs” and it’s yours!! Oh my. I’ve been enjoying your site for hours now!! Started with crochet edgings, and now I’m here at Olaf and Elsa!! You are such a charming gal. Thank you for sharing your passions!! Really enjoyed reading about your crafting journey……especially the part about the knitting needles!! Me, too!! And enough yarn to stock the retirement home!! Very funny! Best wishes for personal and business success and happiness!! I hope you have great success with the pillowcases. I have given them as gifts to the most appreciative recipients. Thanks, especially, for your kindest wishes and “choicest blessings”.